Authorities in the United States say they have indicted 12 Russian military intelligence officers for alleged interference in the 2016 US presidential elections, won by Republican Donald Trump. The accused were part of “active cyber operations to interfere in the 2016 presidential elections”, Deputy Attorney General Rod Rosenstein told a press conference on Friday. The 12 individuals hacked into computer systems of 2016 Democratic presidential candidate Hillary Clinton and the Democratic Party, stole information and then made the obtained documents public while working for the Russian GRU military intelligence service, the indictment said. “One unit engaged by stealing information, a different unit by disseminating the information,” Rosenstein said. In a response to the indictment, the Russian foreign ministry said there was no evidence the 12 individuals were connected to the GRU or other parts of the military intelligence. The ministry also said there was no evidence the 12 were involved with the hacking into the computer networks of the US Democratic party. According to the ministry, the indictment was meant to damage the atmosphere before a summit between Russian President Vladimir Putin and Trump in Finland’s capital, Helsinki, on Monday. According to US officials, the group used two separate techniques to gain access to targeted computer systems. One of these was sending fake emails that would ask the receiver for login information and then sending that email covertly to the operatives – a technique called spearfishing. The other was by hacking computer systems and installing malicious software capable of registering keystrokes, taking screenshots and stealing documents. To make the information public, the indicted individuals then created fake accounts, two of which were specifically mentioned: DCLeaks and Guccifer 2.0. “The defendants falsely claimed DCLeaks was American and that Guccifer 2.0 was a sole Romanian hacker,” Rosenstein said. “Both were created and controlled by the Russian GRU,” he added. The information was then spread to “an unnamed organisation which was used a pass-through”, Rosenstein said. According to the indictment, the hackers also stole personal information of at least 500,000 voters and gained entry to a system involved with voter registration. Rosenstein said these new indictments contain no allegation that any US citizen committed a crime or that it changed the final vote count or election result. What’s next for Mueller’s Trump-Russia probe? 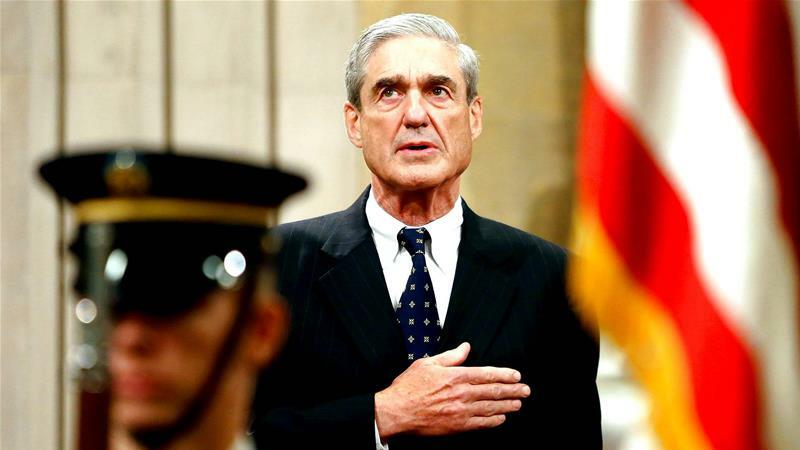 The indictments are part of special counsel Robert Mueller’s investigation into alleged Russian interference in the 2016 elections with the eventual aim of trying to boost Trump’s campaign. Moscow denies interfering. Friday’s charges are not the first for Russian nationals. In February, the attorney general’s office charged 13 Russians and three companies with trying to interfere with the US elections. Using fake personas, Russian operatives bought online advertisements aimed at spreading divisive messages, including ads focused on racial tensions. Thirty-two people have so far been indicted as part of the probe into election interference, which started months after Trump’s inauguration in January 2017 and repeatedly described by the president as a “witch-hunt”. Of those 32, 26 are Russian nationals, five are American and one is Dutch. Those charged include Michael Flynn, Trump’s former national security adviser, who admitted guilt to one count of lying to investigators on December 1; former Trump campaign chairman Paul Manafort’s longtime partner and deputy campaign chair Rick Gates and campaign foreign policy adviser George Papadopoulos. How far will Robert Mueller’s investigation go? Vladimir Putin To The World On Donald Trump’s Pulling Out Of The Paris Climate Accord: ‘DON’T WORRY BE HAPPY’.